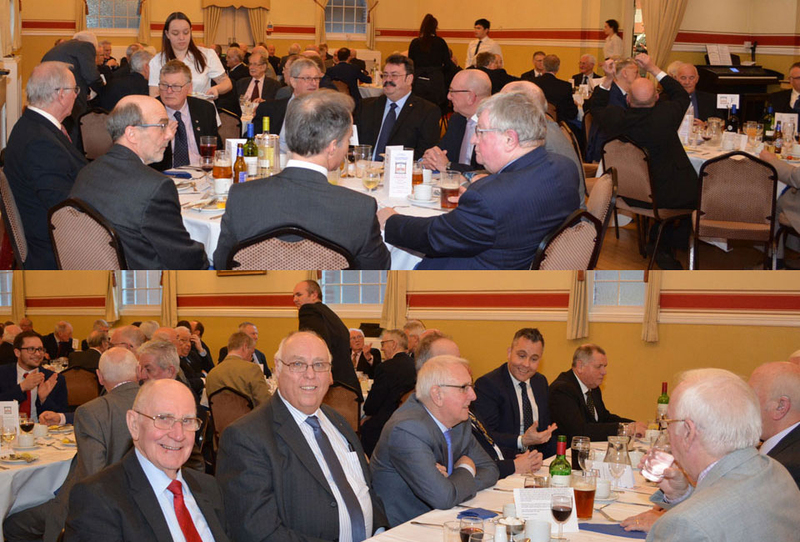 The Warrington Group Chairman’s Dinner was attended by over 80 Freemasons who enjoyed the company of the principal guests, Deputy Grand Superintendent Paul Renton, Assistant Provincial Grand Master Kevin Poynton, Second Provincial Grand Principal Barry Jameson, Assistant to the Provincial Grand Principals Colin Rowling, Provincial Grand Scribe Ezra Peter Taylor and Provincial Grand Scribe Nehemiah David Barr, just to name a few. Following a welcome from Warrington Group Chairman Andy Barton, he called upon Ken Smith to say grace. An excellent three course meal was served by the Masonic hall staff which comprised of smoked haddock and spring onion fishcake, braised steak with onion gravy, roast potatoes and seasonal vegetables, finishing off with fresh fruit salad with cream, followed by tea or coffee. Ken then returned thanks and Andy proposed the loyal toast. John Walkey proposed the toast to Paul saying: “Brethren and Companions, it is my pleasure and privilege to propose the toast to Paul Renton, Deputy Provincial Grand Superintendent. Sir, we are honoured by your presence.” He continued by explaining a short history of Paul’s extensive journey in his Masonic career which highlighted just how much work he had done for Freemasonry over the years. John then asked the brethren and companions to charge their glasses, be upstanding and join him in drinking a hearty toast to the health of our Deputy Grand Superintendent, Paul Renton. Paul, in his response, thanked John in particular and the group in general for the toast to his health. He said he would like to focus his reply on Royal Arch Freemasonry and drew some links that exist between Craft and Royal Arch Freemasonry and compared some features of the Craft tracing boards, ceremonies and certificates to Royal Arch which indicated that the links are strong. He concluded by encouraging any Craft Mason to consider membership of the Royal Arch and hoped the Warrington Group would continue going from strength to strength. David Barr said he was pleased to present on this special evening, how much he had been made welcome and was enjoying the evening very much, even though he was comparatively new in position. David commented on the excellent facilities in the hall and complemented the staff on the meal and the way it was served. He continued by saying the group was very active and busy. David requested all to charge their glasses, stand and drink a toast to the health the Warrington Group, its officials and members. Pictured left: John Walkey proposing the toast to Paul Renton. Pictured right: David Barr proposing the toast to the Warrington Group. Andy Barton was very pleased to respond to the toast and thanked David for proposing it. He proceeded by welcoming Paul and thanked him for his support this evening and for all the work he does for the Province. He also confirmed it’s always a pleasure to be in his company. Andy explained that he would like to formally welcome several guests this evening, including Kevin Poynton, Barry Jameson, Colin Rowling and his colleagues from other groups. From South Eastern Group, Gareth Jones and Nigel Paton, from Widnes Group, Neil Pedder and John Gibbon and from the Leigh Group, Len Hart, Jonathan Heaton and David Case, saying he was honoured by their presence and thanked them for their support and friendship. Last year a tercentenary committee headed by Vic Charlesworth devised a programme of events which Andy was proud to say did justice to the four lodges that met at the Goose and Gridiron 300 years ago. 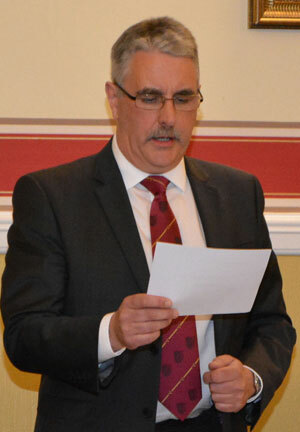 Andy offered his thanks to Vic and the committee and to brethren and companions for their support of those events. The highlight was the Grand Banquet held on 23 June, the eve of the formation of the first Grand Lodge. Warrington was also chosen to host a church service on behalf of the Province, Andy said this was a very proud moment to be a Chairman of Warrington Group. 2017 saw the launch of the MCF 2021 Festival and urged all to give their usual generous support. In January, he appointed Graham Greenall as the Group Festival Representative. Over the next few months he will make himself available to lodges and chapters to talk about the Festival and to assist members to complete a standing order for the Festival. 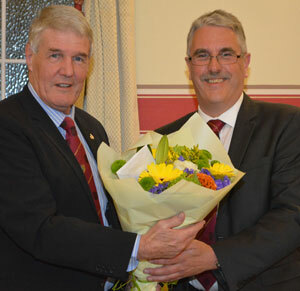 Paul Renton (left) receiving a bouquet of flowers from Andy Barton. Andy said he is also extremely proud of our Light Blues Club, which was founded last year. Sadly, the Light Blues Club Chairman, Glen Screeton, has had to step down for a few months until his wife Clare recovers from a serious illness. I wish Clare and Glen best wishes for her full recovery. The Light Blues Club is continuing in Glen’s absence under Mathew Ross with the assistance of our vice chairman. Continuing, Andy said: “This year, the main focus of the group executive, under the leadership of the group vice chairman has been the introduction of a new mentoring policy. 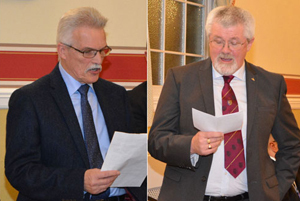 This year I appointed a new group mentor, Paul Rigby and two deputy group mentors, Rob Roberts and David Eccles, with John Gregory continuing as Royal Arch mentor. Thanks to Chris and the team, I believe that the Warrington mentoring policy is at the forefront of mentoring in the Province. I’m looking forward to seeing the result of the policy. Other changes in the group include, as I have already mentioned, the appointment of a group festival representative Graham Greenall, to assist our group charity steward Chris Todd in maintaining support for the MCF 2021 Festival”. Andy also welcomed Rob Crook as web master and thanked him for all the work he is doing behind the scenes. Finally Andy thanked all the group officers, Chris Gleave, John McIntyre and Jim Cartledge for all their hard work and dedication. Andy also presented a bouquet of flowers to Paul, for which he thanked Andy and the group for a most enjoyable evening and for the flowers. The evening was then brought to a close by Chris Todd proposing the janitor’s toast.